Now of course there could be more promises but let’s just take these and really think about all the stories you are hearing that deliver the promises set forth above. Weighing in on these promises are a lot of people who are not getting results. Why? I think that social media is a “layering” process. 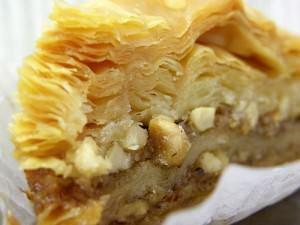 In my talks I share that it is like Baklava, one sweet layer after another. It keeps adding up and, as it does, the layers create a great result. So I am not going to go into great detail offering case studies that prove that social media marketing is effective. I’ll save that for future blog entries. Today, I just want to offer up a metaphor that will, hopefully, get you thinking and, if you will, just try a bite of this dessert!